ViscaTest is our FREE app that lets you test if your device can control Visca PTZ cameras. ViscaTest has built-in instructions to guide you. C. USB-OTG adapter for the phone's micro-USB connector. The connection items (FTDI-chip USB/RS232 cables, Visca connection kits, and USB-OTG adapters) are easily available online. 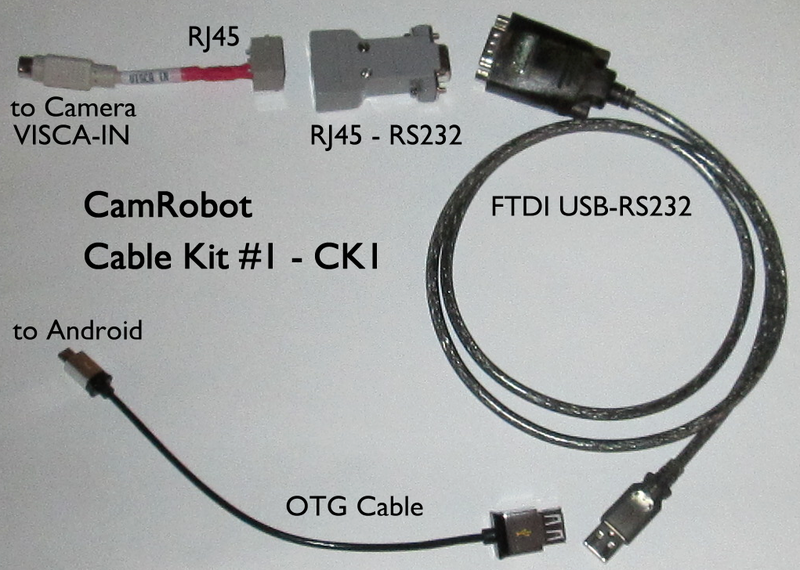 CamRobot.com also offers complete cable kits (see below). You can try ViscaTest alone, but its best to connect your device to the camera's control port to test compatibility. 3. Please use a Visca type camera, set to RS232, 9600 baud. 4. Turn on the camera (power). 5. Run ViscaTest with everything hooked up and try the pan/tilt (up/down/left/right) buttons, etc. NOTE - Almost all modern Android devices and Sony cameras support CamRobot technology and many other brands do as well. If you have a very old Android device that does not support 'USB Host Mode' then it cannot control cameras. That's what ViscaTest is for - to help you test USB Host Mode and camera compatibility. If your phone or tablet doesn't work, don't worry - CamRobot-compatible phones and tablets are plentiful and easy to find. You can read more about ViscaTest and evaluating your device's compatability below. 9. Motion speeds are saved and recalled when app starts. 13. Set Standard or High pan/tilt precision as required for your cam. 14. Registration Key for CamRobot PLUS upgrade. CamRobot PLUS is the ultimate PTZ camera app. 3. Like a 'proportional' joystick, move your touch to speed up/slow down. 4. Controls 7 cameras linked in Visca 'daisy-chain' fashion. 5. 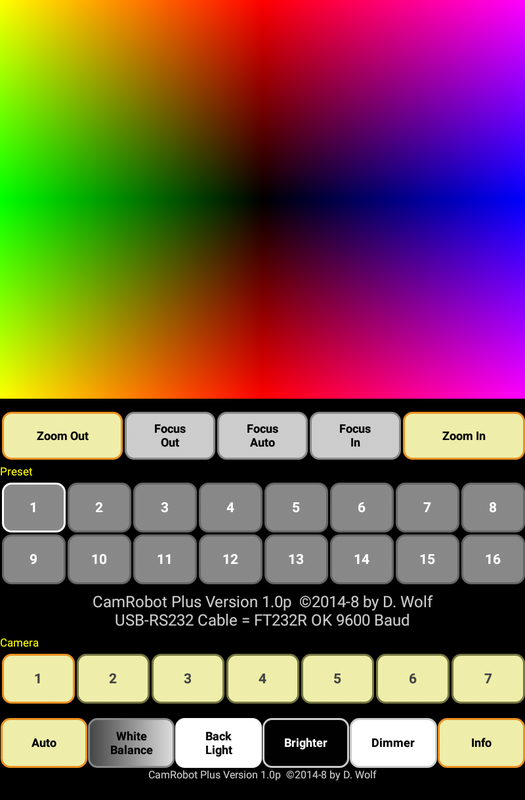 Five-spot control and Rainbow control are selectable. 6. Select 16 presets mode for advanced cameras. 7. Motion speed selections are saved separately for each camera. To upgrade, provide the CamRobot Registration Key and pay with PayPal - only $149. Contact us to upgrade and we'll step you through the very simple process. We send your private registered CamRobot PLUS file to your device's GMail address. Then install CamRobot PLUS from the app file on your device and you're ready to go. 1. 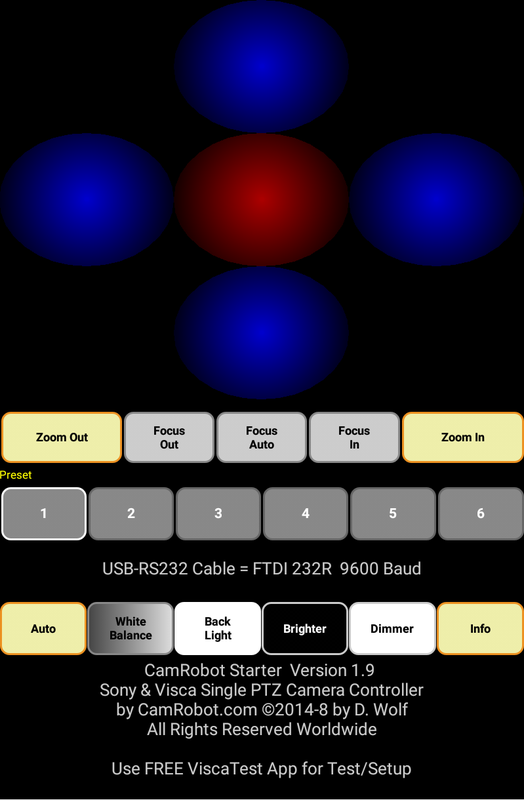 Please install the ViscaTest app (FREE in the Google Play Store) onto your device, and then attach an FTDI-chip RS232/USB cable to your Android device's USB connection (some devices may need an OTG cable as well). Follow the ViscaTest app's built-in instructions to test if things will work right on your Android phone or tablet. 2. Success with ViscaTest is the *ONLY* way to be sure your Android device will work as a CamRobot PTZ controller. ViscaTest is FREE. Get it at Google Play Store and follow its simple built-in instructions to test your device. We cannot test your device for compatability - you need to do that. That's why we created the ViscaTest app and put it out FREE for you to check your own Android phone or tablet for compatability. You'll need to get an FTDI-chip RS232/USB adapter cable to use in the ViscaTest. They're available at very low cost from many online suppliers. Be sure you get a USB/RS232 adapter with the FTDI chip. 3. 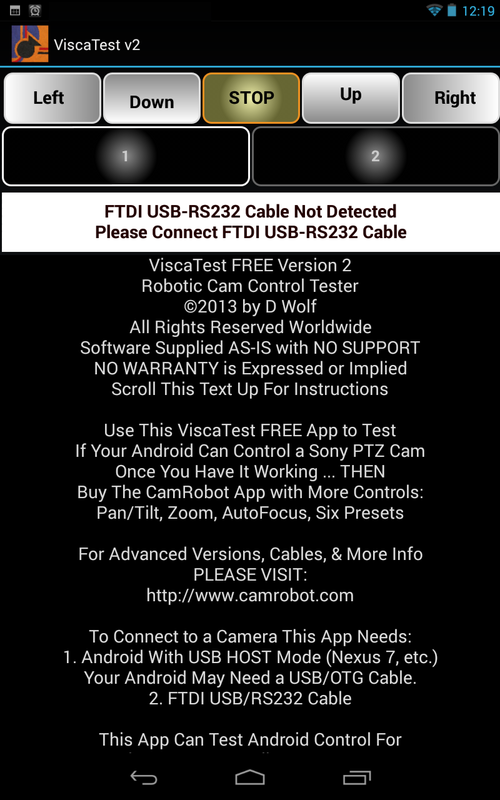 Photos (below) also show how to connect a Sony PTZ Visca camera to your Android device for the ViscaTest compatability check. 4. If ViscaTest works on your device then CamRobot will also work. 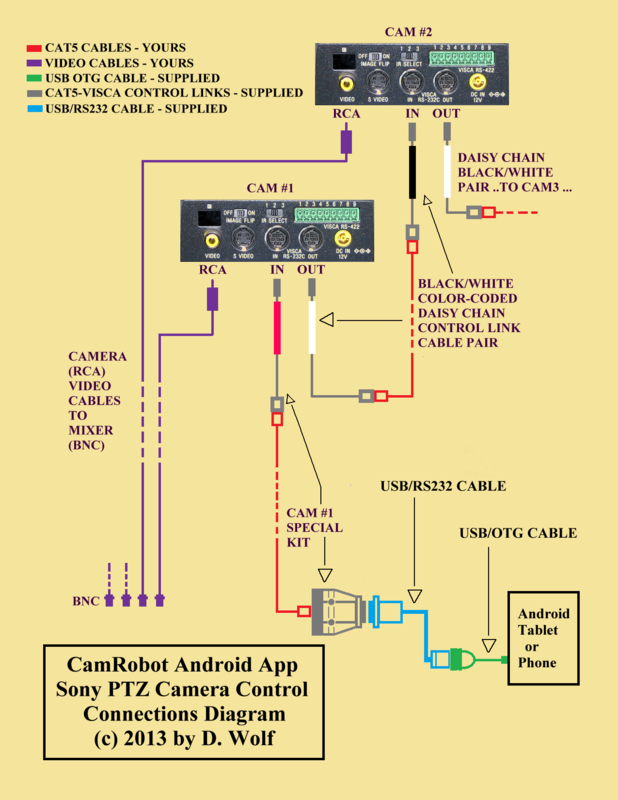 You can now install the CamRobot Starter App from the Google Play Store and you'll be able to control one camera through the USB/RS232 FTDI cable once you connect it up to the Visca 'IN' connector on your camera. 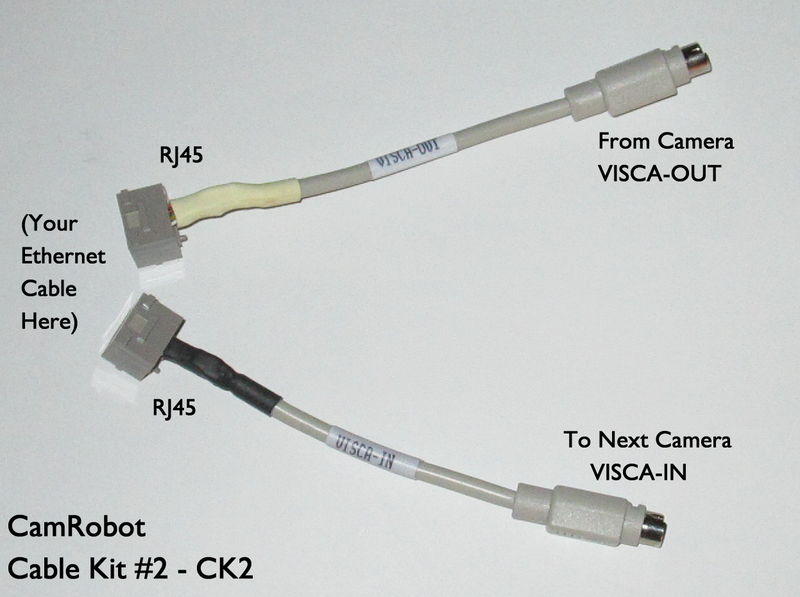 We have connector kits available (see below - our CK1, Cable Kit 1 to link up the phone/tablet to the first camera). 5. If ViscaTest does not work on your device then please get one of our pre-installed, ready-to-use CamRobot systems. Most newer Android devices pass the ViscaTest but some simply don't support this technology. We can't tell you why and we can't 'fix' your device or tell you how to make your device support this technology. ViscaTest will tell you if your Android device will work or not. If you want to try using your own Android phone or tablet as a CamRobot PTZ controller then please do the ViscaTest check first. It's FREE and it will tell you for sure if you can move on to the next steps that turn your personal device into a CamRobot controller. 6. CamRobot technology is only for Android; proven on many tablets (e.g. Nexus 7), phones (like Samsung Galaxy S3 SH-I747) and other Android platforms. Most newer Android phones and tablets devices work nicely with CamRobot. 7. Once ViscaTest shows you this technology will work for you, get the CamRobot Starter app on Google Play Store. 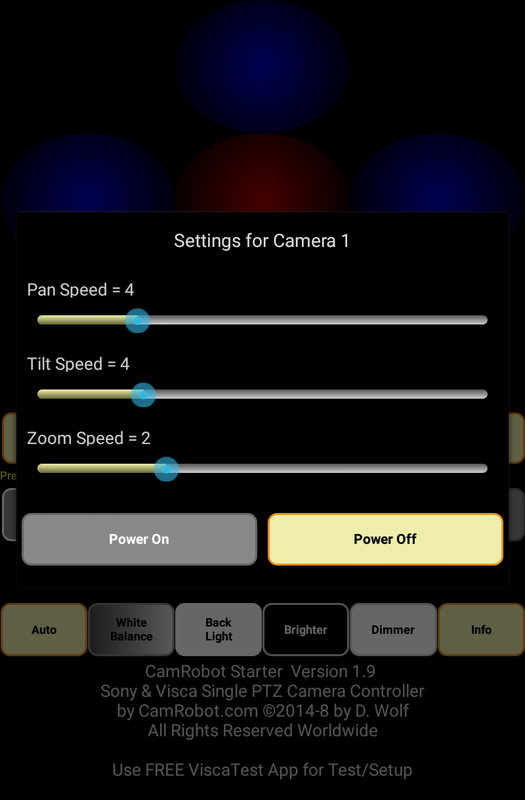 The CamRobot Starter Version App has been updated to version 1.9 that includes setting and storing camera pan/tilt/zoom speeds as well as added fine focus controls and proc-amp controls. There is no additional charge or price increase for these improvements. Once you have the CamRobot 'Starter' app working on your device you can continue with that or move on to upgrade to CamRobot PLUS. 8. Use the ViscaTest FREE App first to test our Sony PTZ control technology on your Android system. 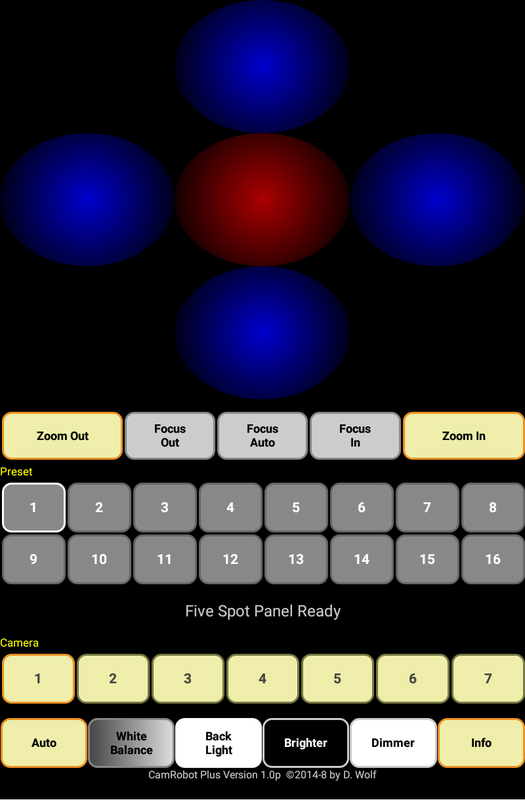 When you get it hooked up and working with your cam, then purchase CamRobot Starter App (on the Google Play Store) to control one camera: access to save/recall 6 presets, zoom in/out, and autofocus. CamRobot Starter is only $49 on the Google Play Store and works with the connection setup you've already tested using the FREE ViscaTest app. If you need to control more cameras or want the advanced features like backlight, white balance, etc. please contact Videobotics to purchase the CamRobot PLUS version and multi-camera cabling kits, etc. 9.ViscaTest, CamRobot Starter, and CamRobot PLUS have been tested on Google Nexus7 (both the original 2012 version and the 2013 FHD version), Nexus 9, BLU and Samsung phones, and many more devices. To use your own device, you need Android OS Version 3.2 or higher AND 'USB Host' support. Our ViscaTest app is FREE and lets you test your Android phone or tablet to see if CamRobot will work for you. Uses *your* Ethernet Cable to connect your Android to one Camera up to 200 feet (60 meters). NOTE - Exact appearance may differ from the photo. Use *your* Ethernet cables to link more camera Visca ports. One CK2 is required for each addditional camera. 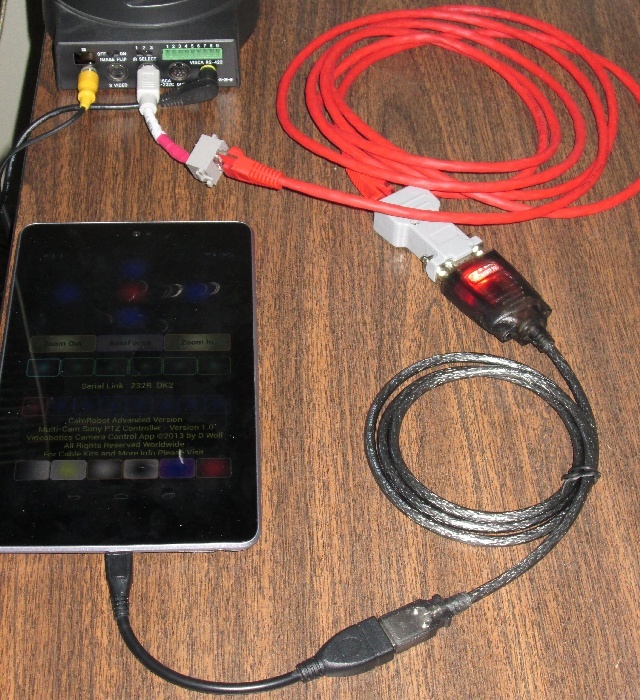 This shows a Nexus7 tablet with OTG cable connected to the FTDI USB/RS232 cable, all linked to a Sony EVI-D70 camera's VISCA IN port through a CAT5 cable (red coiled cable). The Nexus7 is running the CamRobot app! Here's a general diagram showing, all at once, what all those pictures above are showing separately. When you purchase the CamRobot ADVANCED Version (only) you will receive the App, the USB/RS232 cable, the USB/OTG cable, and the appropriate number of CAT5-Visca control link kits. Contact us for pricing for multiple control cable connection kits for up 2 to 7 cameras. You supply the Ethernet/Cat5 cables to connect your camera control Visca ports, the lengths you need them to be. Web pages, images, control applets, & file downloads: (c)1990-2018 by D. Wolf. All rights reserved worldwide. Permission granted for personal non-commercial use only. The statements in this web site are not intended to express or imply any warranty. Specifications, pricing, and availability subject to change without notice. Thank You for visiting the CamRobot Do-It-Yourself page. Come Back Soon!